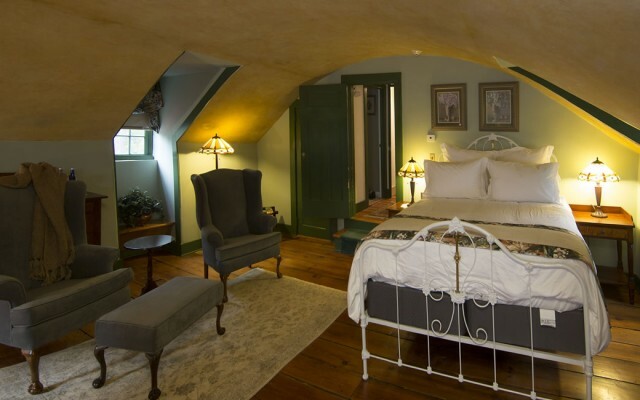 The Rose room is located on the 2nd level of the Inn and overlooks the gardens at Old Drovers. 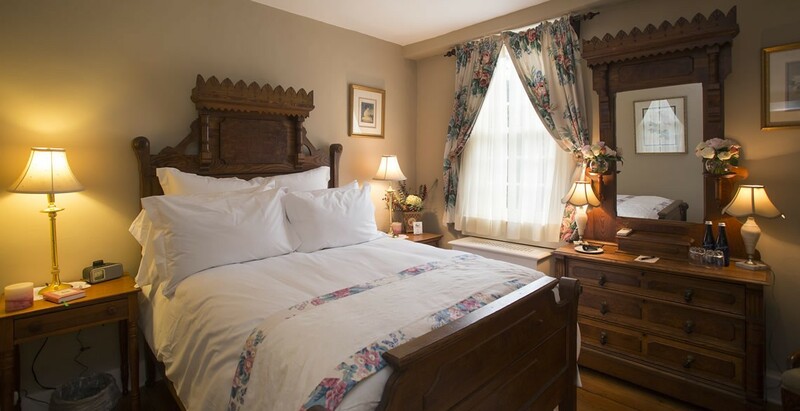 With a full sized, beautifully crafted ornate walnut bed, this quaint room features a private bath with walk in shower. 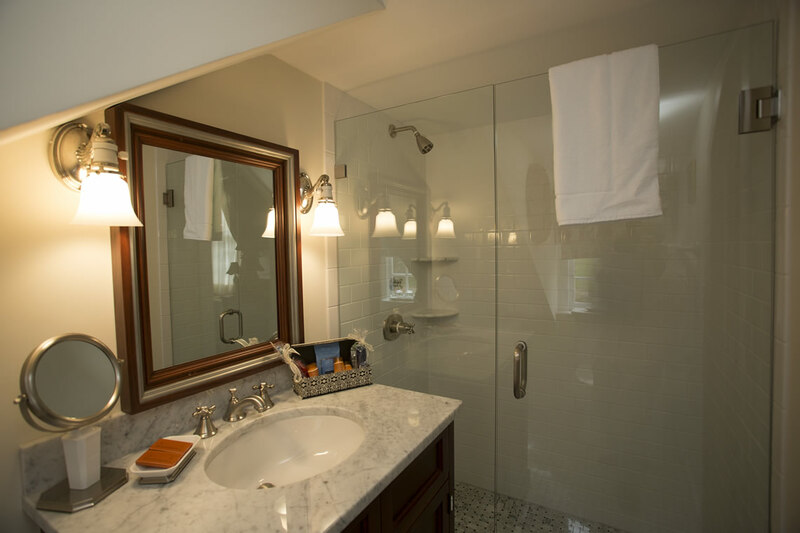 Mid-week rates available, off season. Extended stay discounts available. 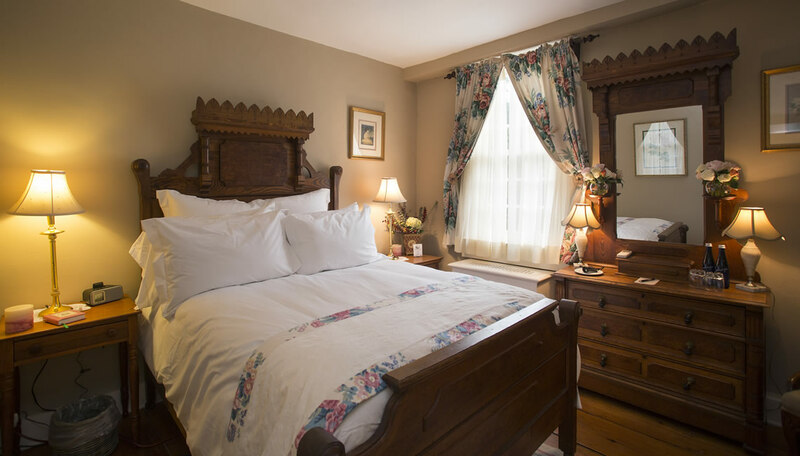 The Inn features comfortable common space in the Lobby, Sitting room and Library and Six guest rooms, each with its own bath. We emphasize physical and emotional comfort, the lost art of lounging around, and excellent food. Guests expecting a continental breakfast will be disappointed. Why? Because we serve a healthy breakfast made with local ingredients from farm to table, and it’s different every day. Local farm fresh eggs with chives from the garden, homemade home fries with bacon and sausage, pancakes, pastries and yogurt and fruit parfaits might be on the menu on any given morning. Borrowing from English bed and breakfast tradition, high tea is served from 4pm in the afternoon. Legend has it that the Duchess of Bedford (1788-1861) complained of lack of energy in the afternoons and instituted a “high tea” featuring light fare such as crumpets, scones, crust less sandwiches and pates to keep her going until dinner. The emphasis was in conversation and presentation, a tradition Old Drovers Inn will continue with an array of cookies, breads, pastries, and whatever is appropriate for the guests, the time of year, and even the weather.